The FPT-6000 series has been discontinued. Please see the FPT-3000 series as a possible alternative or contact our Flow Engineering department. The FPT-6000 is a highly accurate averaging pitot tube which generates a pressure differential between its upstream (stagnation) ports and its downstream (static) ports that is proportional to the flowrate squared (Q2 ). The differential pressure can then be measured by a differential pressure transducer (PX760 Series) to provide a 4-20 mA output which is proportional to the flowrate squared. This can then be read out as flowrate by devices with square root extraction, such as OMEGA’s DPF64-SQRT meter or FC-20 mass flow computer. The FPT-6000 can be used to measure clean, low viscosity liquids, gases and steam in a variety of piping systems and pipe sizes (to 72" and above on special order). Complete this questionnaire to size the Pitot tube for your application. 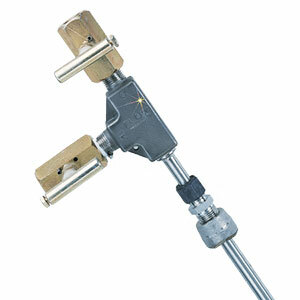 For Model FPT-6100: Add 47⁄8" to line size to determine overall length without valves. Add 7½" to line size to determine clearance required to install unit. NOTE: Use of these equations for liquids yields an accuracy of ±2% of rate. When used for steam, accuracy is ±10% of rate (when steam tables are used). Gas equation yields ±2% of rate accuracy from 21 to 204°C (70 to 400°F) and 0 to 150 psig (when gas is not near its critical point). A ±1% of rate accuracy requires the use of more precise equations which account for shift in K with change in flowrate, gas compressibility, etc. Request a precision flow calibration sheet and please supply the following data: name of fluid, specific gravity, pressure, temperature, inside pipe diameter, viscosity, steam quality, degrees superheat, and ratio of specific heat at constant pressure to that at constant volume (for gas velocities approaching 500 fps). Please call Flow Department for questionnaire to size the Pitot tube for your application.